I recently asked Alisha Kerlin and D.K. Sole if they would join me for a walk through the exhibition to talk about the show and create a list of questions for the five artists. Alisha Kerlin, Spring 2012 UNLV Artist-in-Residence, relocated to Las Vegas from New York and is currently serving as the Interim Director at the Museum. D.K. Sole joined the Barrick team in 2012. She leads educational tours and produces written material for the Museum. Many thanks to the artists, Kerlin and Sole for agreeing to participate in this current S + N series “5 for FIVE” and for sharing their unique insights into the work and its reception by the public. This fourth post shares our interview with artist David Gilbert. 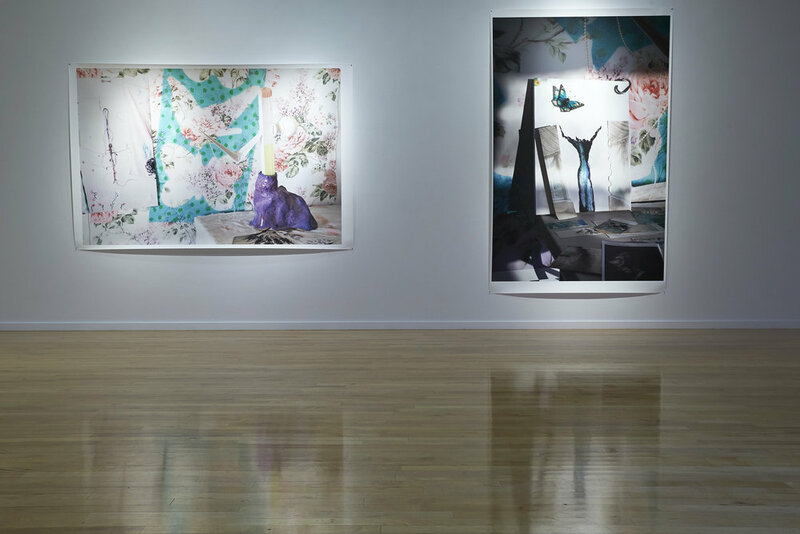 David Gilbert lives in Los Angeles, the city that introduced him to the brightly filtered light that illuminates his photographs of studio-bound installation ephemera: exquisitely groggy stage sets of gauze, fake butterflies, and painted sticks. In Las Vegas for his residency in 2014 he discovered that the Barrick’s current interim director enjoyed thrift stores as much as he did. The prints he makes are large and handsome but he has asked the Museum to treat them with a contradictory casualness, leaving them unframed and fastening the corners to the wall with push pins. His work posits its opposing ideas lightly. We’re under the impression that you like your constructions to maintain a state of potential flux. Do galleries or other institutions ever ask you to exhibit them as objects in their own right? Would you ever do so? DG: Earlier on, I did show more sculptures, objects, and installations. If I did, they were often pieces that had a dialogue or relationship with photography. Now, by showing the photographs mostly, the work has developed a funny relationship to denial. The viewer only has access to the material objects and the space of the studio through flat photographs. I control the viewer's point of view and how one sees this world that I have created. In The Seagull, 2015, you’ve aimed your camera diagonally downwards across the top of a bag-like object that seems to be resting on the floor. We don’t remember seeing that downwards angle in any of your other works. Is it genuinely unusual for you, or do we have the wrong impression? If it’s really as uncommon as we think then what was it about this image that made you decide to choose it? Finally, why is it called The Seagull? DG: Wow, what an astute observation! I do generally photograph more head on. I want my work to have a relationship with historical painting, so I often approach an image as if it were a portrait or a still life: with a clear subject and horizon line. That said, I’ll try anything to get a good photograph! I had been trying to photograph The Seagull, which proved to be difficult. But, one day I was looking down at it and realized that was an interesting angle, so I pulled out my camera and photographed. As far as the title goes, I often name the pieces by how I refer to them in the studio or in my head, often it’s what a sculpture or a scene reminds me of. I’ll think of a piece as The Seagull or The Giraffe, and once the photograph is made, it seems natural and easy to title the piece that way. Could you talk to us about your editing process? How many times do you usually photograph a single construction? Do you usually know straight away when you've got a shot that works? Do you ever revisit and rescue rejected shots? DG: I photograph works endlessly. Often it’s the conversation between photographing and making that helps me understand how to move forward on constructing something or helps me know when it is done. For example, I’ll photograph a sculpture, and once I see the image, I’ll say to myself, “oh, that needs to be painted red,” or “oh, I should cut that in half.” Sculptures can appear in many images: sometimes as the central subject and then again in the background, in a more supporting role. Photography was my introduction to art making, and I’ve been taking photos since high school. It’s what I do in my studio most effortlessly. I take photos in my studio in the morning when I arrive, in the middle of working on something, and right before I leave in the evening. I often wait to sift through the photographs I’ve taken. I find that the longer I wait, the more objective I am about which images are actually good. Looking at a group of photographs a few months after they’re shot, I can realize I overlooked a really good image and bring it back into the mix. The objects in Diva, 2016, and Grandmother’s House, 2015, look as if they must be small in real life, but the photographs themselves are huge. The size of the objects in Giraffe might have been hard to work out if we didn’t have a few clues, such as the clamp on the floor, to give it away. Could you talk about the role of scale in your work? DG: I think about scale in two ways: in terms of the scale of what I’m photographing and the scale of the prints I make. The things I make in the studio often have very little reference to something in the outside world, it’s not an apple or a portrait of my dog or a desert landscape, so at first the viewer doesn’t know exactly what it is they are looking at. It’s a fantasyland of my own creation. That said, there are things laying around the studio: scissors, extension cords, etc. that wind up in the photographs, and I like that the photographs do have a relationship with the real world. The pieces can operate as puzzles in terms of scale: sometimes when you first look at a piece, you have no idea if the thing being photographed is giant or miniature, but as you spend some time looking, there are clues. I play with that further in printing. Often images of really wide shots or big installations I print really small, making the scenes like little jewel boxes for contemplation. Conversely, photographs of smaller sculptures or details I print as large as possible, so that in the final print, you can see even more than you could with your naked eye. Printing things at different scales for an exhibition is a way of making photography dynamic. Large prints reveal details you cannot see online. Combining both big and small pieces makes viewers have to be active physically when looking at artwork in an exhibition space: getting close to examine smaller works, and stepping back to take in giant ones. A group of children in a tour group once began to talk about Diva and Grandmother’s House in terms of fairy tales and stories; they said that if they stepped inside then it would be “like Alice in Wonderland.” What do you think of that reaction? Would you agree that there is something fairylike or uncanny in these combinations of objects that are either real but not in a primary sense (the curtains are torn photographs of curtains; the butterfly is made of plastic or glass) or else have an identity that seems ambiguous (the purple form in Grandmother's House suggests a cat without really looking like one, and an adult visitor identified the long wooden object inside it as a match until someone pointed out that it was supporting a doorknob)? DG: I love this interpretation! I often think about Alice in Wonderland and fairy tales in relationship to my work. I yearn for a childlike sense of wonder, but I try not to over romanticize it. The flip side of joyful, childlike wonder is that the world can be a scary, confusing place that one does not fully understand. I like the contradiction that the photographs are really sharp and describe a world we (kind of) recognize but what exactly the things in the photographs are remains mysterious. I hope they are images full of magic and wonder. 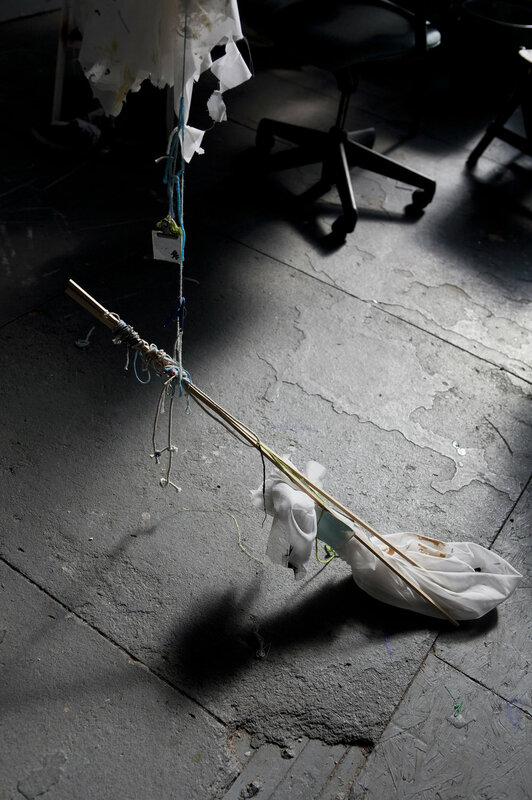 David Gilbert’s work inhabits the space between installation and documentation. 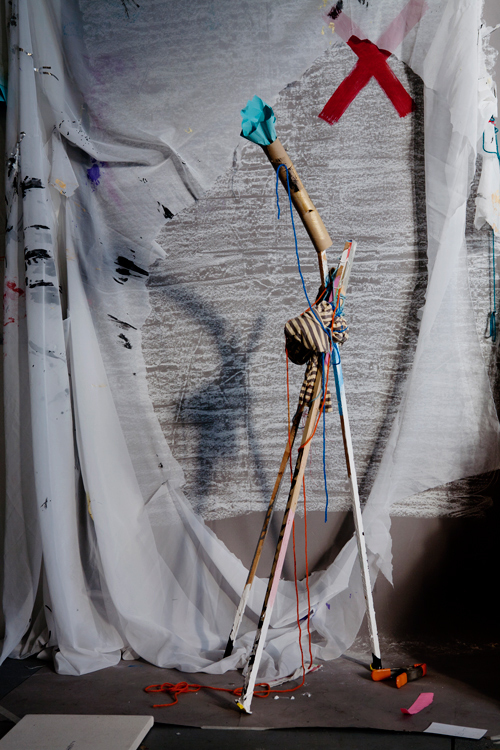 Fragments from the artist’s practice are hung, stacked and layered against studio walls, windows, and corners in disheveled yet specific assemblages, then photographed to emphasize the materiality of the objects and the physicality of light. Gilbert lives and works in Los Angeles, CA. UNLV Artist-in-Residence Spring 2015. Read the Deborah Aschheim, Ash Ferlito and Erin Cosgrove interviews here.